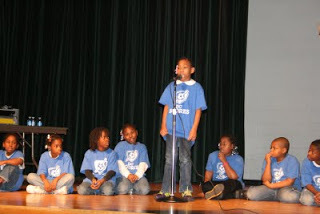 DC Scores had their 12th annual Poetry Slam at Kelly Miller Middle School in southeast Washington DC on Thursday, Dec. 3. SOYA’s founder Khadijah Ali-Coleman worked with Kelly Miller’s DC Scores’ students for eight sessions where she worked with them on basic music theory, songwriting and stage choreography. Click HERE for more about the poetry slam on Examiner.com.